Despite being an old breed, the Scottish Terrier's history is somewhat obscure and undocumented. The Scottie's origin is believed to date back to a dog that was described by Pliny the Elder in 55 B.C. When the Romans invaded Britain, he wrote, "They found, much to their surprise, small dogs that would follow their quarry to the ground". The Romans called the dogs terrarii, which means "workers of the earth" and is derived from terra, the Latin word for earth. The Scottish Terrier was a hunter and still hunts by instinct today. The Old Scotch Terrier is believed to be one of the oldest breeds in Scotland and the foundation dog for all of today's terrier breeds. The breed is extinct today but was described as a stable worker with strength, courage, and stamina, who could breach his quarry's rocky dens. The breed was a black or sandy-colored dog that was low in stature, strong, with long hair and small, half-prick ears. If we fast-forward from the first few centuries to 1436, we find a description, in Don Leslie's book A History of Scotland, of a small dog similar in form to the Scottish Terrier. By the early 1800s, many writers wrote of two separate terrier breeds in Britain, the Scottish Terrier (distinguished by its rough hair) and the English Terrier (identified by its smooth hair). Somewhat earlier, in the seventeenth century, James I of England sent several dogs to France as a present to the French monarch. Those dogs are believed to have been foundation dogs for the modern Scottish Terrier. The king's love of the breed helped to increase its popularity, which rose over the next three centuries. During the 1800s, Scotland had many terriers. By the end of the century, the dogs had been separated into two different groups, the Dandie Dinmont Terriers and the Skye Terriers (although the latter was a fairly generic name given to all terriers that came from the Isle of Skye). 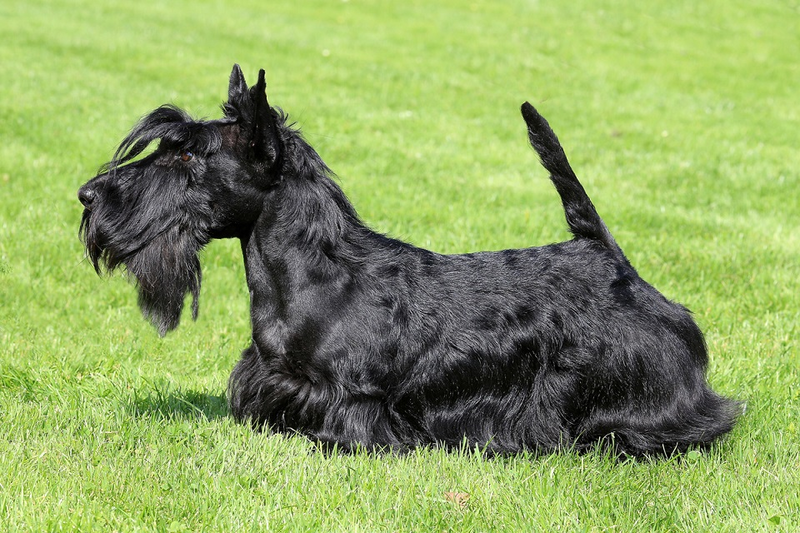 The Scottish Terrier was grouped under the Skye Terriers and shown under that class in the show ring until the 1870s. At that time, the standard for the Scottish Terrier was written and, by the end of the nineteenth century, the Skye Terriers had been divided into the four different breeds we know today: the Scottish Terrier, Skye Terrier, West Highland White Terrier, and the Cairn Terrier.